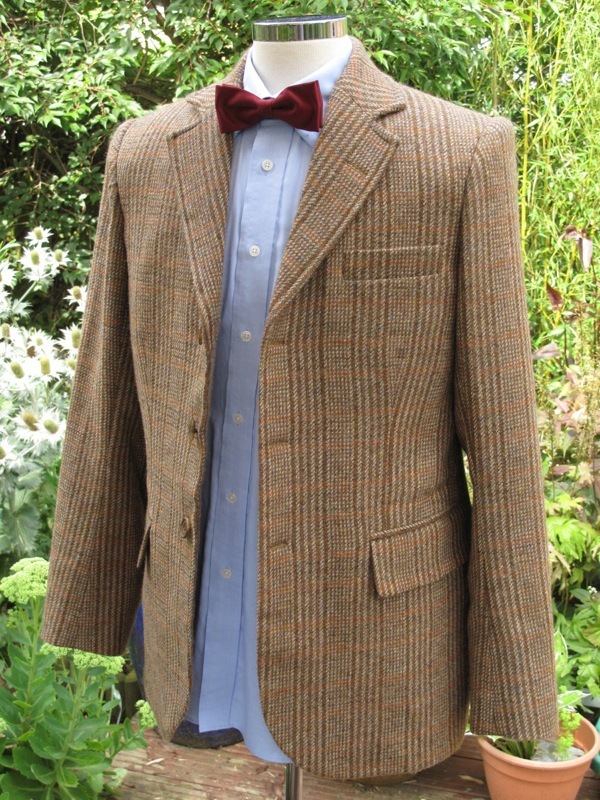 It would appear that new companion means new wardrobe for The Doctor. But despite this there are few things which are hanging over from his previous life-chapter. He still continues to wear the same black G-Star RAW jeans; eagle-eyed readers will notice him wearing his old black boots again in Cold War this week; and last week in The Rings Of Akhaten he was flashing around his glasses. 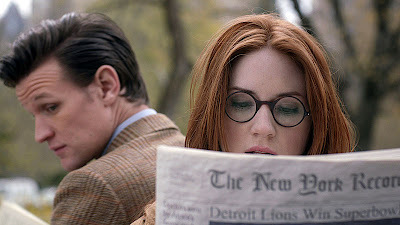 The glasses were originally worn by Amy in The Angels Take Manhattan, and were pinched by The Doctor, since when he seems to have adopted them as his own. It’s like he’s clinging on to them as a perpetual reminder of the companion he lost. They are quite distinctive, with large circular lenses; frames in a tortoise shell effect; and if you look closely, two front facing screw-heads where the bars join the frames. I’ve had a number of emails this past week, asking where the glasses can be found, and thanks to one of my readers we now have a possible suggestion of a good match. The blog suggests two similar brands - the Black Eyewear Chico or the Anglo American 400. Now, I’m not entirely convinced these are the exact same glasses, but they certainly tick a lot of boxes. My feeling is the hinge on the side of the frames appears to be a bit heavier than screen-worn. The frames read as being thicker and a lot lighter, but the shame and details do feel right. Do you think they are THE glasses, or just a very good second best? 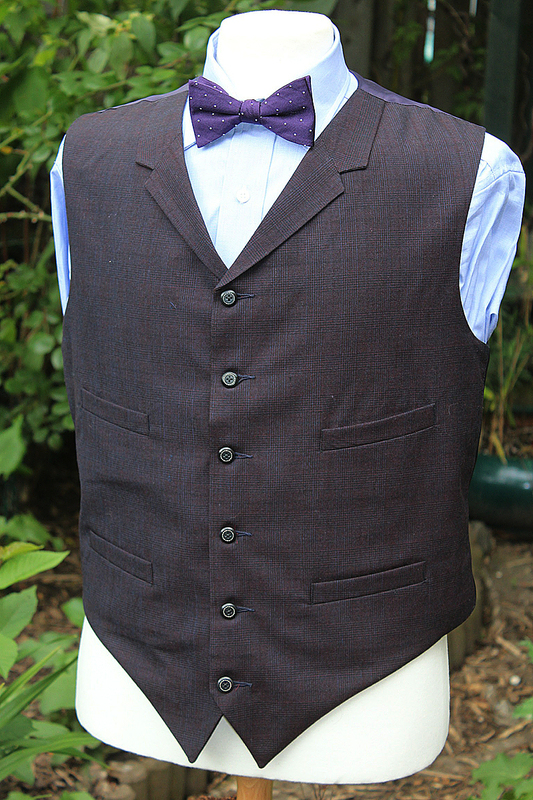 If you’ve spotted a better pair, or found the precise correct screen-worn version, let me know. Right I have been on the search through the vortex of cyberspace and I have found out that the glasses are Anglo American 400s but the company do make 5 different colours and a couple of variations for this model. As you can see from the link Amy's could be a different make all together but The Doctors could be the ones Matt has acquired from filming Bert & Dickie. While certainly a splendid close-enough, they are almost definitly not the same glasses. The 'stem' on the screen-used glasses seem more round and detailed that the Anglo-Americans, and there's small details on the originals not found on the AA's. I wouldn't be surprised if it's the same people that made Tennant's glasses that made these, making them very hard to find. Either that, or they're vintage, they definitly have a very antique and expensive look to them. 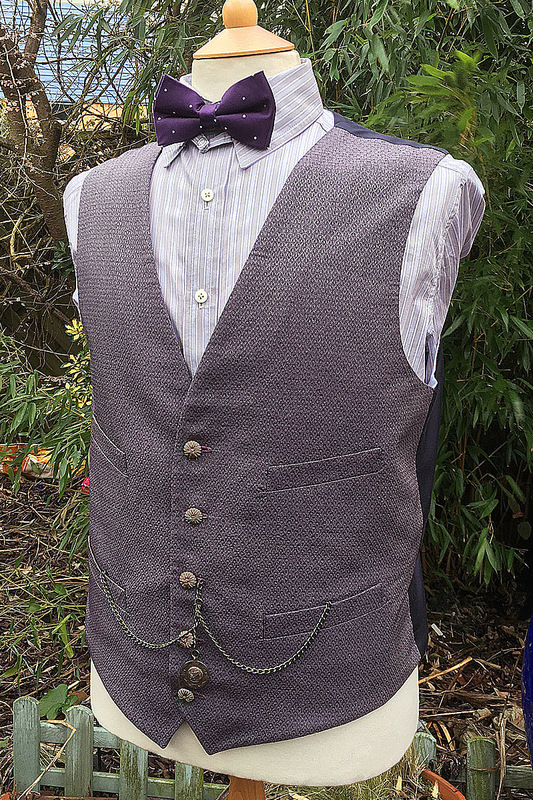 Looks like they were made for a BBC show Matt was in called Bert and Dickie, set in the 1940s (made in 2011). 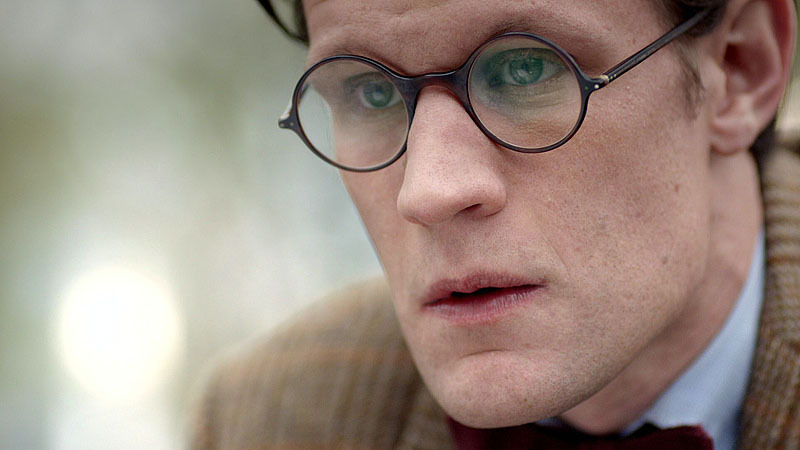 He then seems to have kept them for himself and was seen wearing the glasses in public, in February 2012. Shortly after that he started using them in Doctor Who. Tortoise-shell? I swear they look dark red with a slight effect to me. I tried some of these on sale or return to try before getting a prescription made up - they look ok but not the same - they are also very small so if you are tiny they are fine - if not don't bother. I found this model. Could be compatible? The Black Eyewear "Chico" have a better bridge, more similar to the real one. But it has no screws and it's a bit heavier. The Epos "Palladio" are too thick. 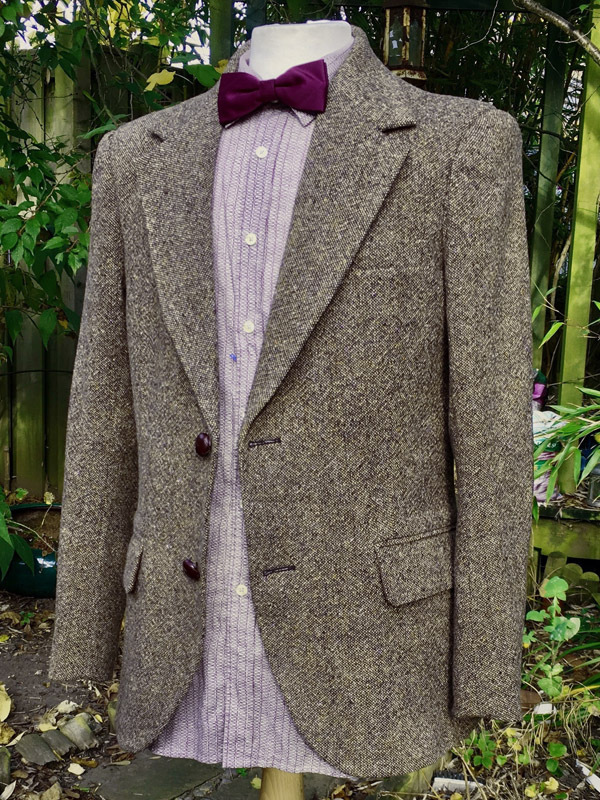 The original ones are definetly the ones Matt Smith used in Bert and Dickie. Too bad it seems impossible to track them down. I'm losing my mind over this! The best copy of the Smith glasses I've found are those made by Magnoli clothiers, available both on their website and on Amazon. They look incredibly like those used onscreen.